The Transgender Day of Remembrance (also called the International Transgender Day of Remembrance or T.D.O.R.) is an internationally observed event, taking place annually on November 20th, to memorialize those who have been murdered as a result of transphobia, and to increase awareness of the ongoing violence and discrimination that members of the transgender community continually endure, simply because they choose to express their gender identity as they wish. The event was initially started in 1999 by transgender activist and writer Gwendolyn Ann Smith, who wanted to create something that would highlight anti-transgender bigotry and violence. “With so many seeking to erase transgender people– sometimes in the most brutal ways possible–” Smith once wrote, “it is vitally important that those we lose are remembered, and that we continue to fight for justice.” Though it started as a small-scale web-based movement, it has since grown to an international phenomenon, with hundreds of vigils being held across the United States and abroad to remember those lost– this year, the toll rose to close to three hundred individuals whose lives were violently taken. 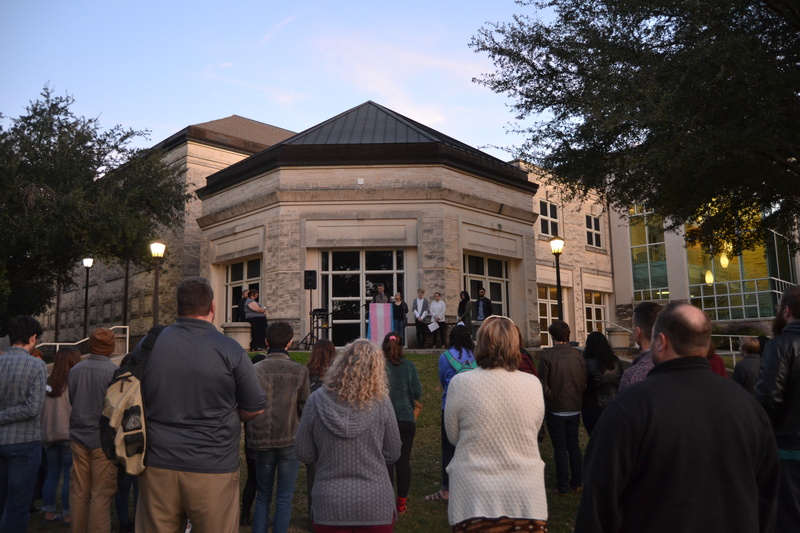 On November 20th of 2017, the Southwestern University community officially observed the event for the first time since its inception. Student organizations Pirates for Pride and Muslims and Allies co-sponsored the event, a vigil held on the Academic Mall, at dusk, on November 20th. Dozens of students, faculty, and members of the administration gathered to hear words of mourning and hope from President Edward Burger, several of the student organizers, and members of local LGBTQ+ organizations, before moving on to the most important part of the vigil: the reading of the names of those lost in the last year. The sheer number of those victims being honored was overwhelming, particularly because the names read were only of those who were murdered outright for their identity; the number of those transgender people who experience other varieties of violence and oppression, while not recorded here, is doubtless even more staggering. Upon arriving at the vigil, each attendee was given a carnation, either pale blue, pink, or white (the colors of the transgender flag) and, once reading the victims’ names was complete, the assembly observed a moment of silence and placed the flowers on the grass in front of their feet. It was an emotional and somewhat draining event for all those involved, but recognizing the momentous loss of life, and feeling that grief, seems often the best way to honor the dead. While the Transgender Day of Remembrance primarily takes place to reflect on lives lost to anti-transgender bigotry, it is equally important to look to the future of this cause. In the weeks leading up to the T.D.O.R. vigil, much of the promotional material posted around campus was vandalized or simply ripped down, this proves that prejudice towards non-cis-gendered individuals is a very real issue, even here in the relatively safe space of Southwestern University. Educate yourself about the cause (T.E.N.T. is a great resource for this). Contact/call/write to your representatives about the issues (Equality Texas can help you stay up-to-date on current legislation, check out their TransVisible Project). Like/follow Pirates for Pride on Facebook and @pirates4pride on Instagram to learn about the weekly meeting times and on-campus events. Be kind, loving, and respectful to all you meet.